Delkin has added Secure Digital (SD), MultiMediaCard (MMC), and Memory Stick (MS) formats to its line of fastest PCMCIA Adapters on the market. The eFilm PRO CardBus 32-bit PCMCIA adapter is four to six times faster than all current conventional 16-bit adapters and has ushered in a new phase of adapter performance. PCMCIA adapters have long been popular for their convenient size and ease of use for quick file transfers from memory cards to laptop computers. 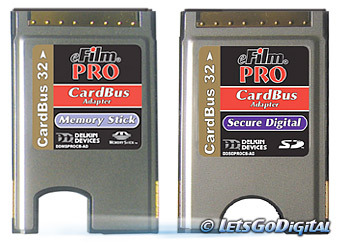 The eFilm PRO CardBus 32 is the only adapter that achieves maximum speeds from the popular high-speed professional grade memory cards that are currently popular with high-end SLR digital cameras. The SD/MMC and MS CardBus 32 Adapters joins the initial CompactFlash (CF) CardBus Adapter that was released at the end of last year. With the new introduction of video cameras, which require high-speed SD cards and mobile phones that use both SD and MS cards, a faster way to get data from the card to a mobile PC is required. All CardBus 32 adapters allow memory cards to work in the PC Card slot on most Windows based laptops and uses the high speed CardBus PCMCIA standard. The Delkin 32-bit CardBus adapter has the same size, shape and design as existing 16-bit adapters in common use now. However, Delkin CardBus adapters and all CardBus products worldwide have a set of gold dimples or "buttons" across the top of the leading edge, which inserts into the laptop. These buttons serve a keying function and prevent the insertion of the adapter into non-CardBus compatible laptops. CardBus slots are common on all modern laptops from manufacturers like Dell, Toshiba, Sony and many others. CardBus slots are backward compatible with the 16-bit slower adapters. They insert completely within its host without any external cabling and operate at a power-saving 3.3 volts, extending battery life in most configurations. The CardBus standard, while not well known to the general computing population, has been in place since 1997, and supported by virtually all notebook vendors since 1998. CardBus is standard on virtually all modern Windows and Mac OS systems. Tests on Delkin eFilm PRO cards and other high-speed CF cards revealed similar speed increases of four to six times that of standard 16-bit adapters. 100 Megabytes of JPEG photos on a Delkin PRO card were transferred to a Dell laptop with both a Delkin 16-bit adapter and a CardBus 32 adapter. The CardBus adapter took 18 seconds (5.5MB/s) to transfer the images and the standard adapter took more than four times as long, taking one minute, 26 seconds (1.16MB/s) to transfer. The Delkin CardBus 32 adapter has a theoretical maximum speed of 132MB/s. Speed in real world applications is determined by the speed of the CPU and flash chips within the memory card. High-speed cards like the Delkin eFilm CF PRO, IBM Microdrive and the new SD PRO will operate much faster than other cards not designed to be high speed. Delkin CardBus 32 adapters also utilize a patented chip, which reduces the burden on the host CPU to 10% or less, further increasing the value of this product. Delkin will introduce Apple drivers at PMA 2004 in Las Vegas, as most Apple laptops also support CardBus.